Paul Krugman recently wrote an article in the New York Times posing the question: if repealing Obamacare is off the table (for now), should people on the “progressive” end of the political spectrum push for a single-payer “Medicare for all” system or just advocate for incremental improvements to the privatized Obamacare model? He says if we were starting with a blank slate, he would favor the single payer model. But, he argues, the politics of moving to single payer are too difficult, and the evidence from other countries suggests that a privatized model can achieve comparable outcomes. Therefore, he argues that progressive politicians should turn their attention to other social policy priorities like subsidized child care and pre-kindergarten education. I generally agree with Krugman’s proposal to focus on incremental improvements to Obamacare, particularly if the objective is just to maintain and improve access to health insurance. But that’s not our only objective. We should also care about the quality and cost of health care. I’ve long felt that policy to increase access to care should be linked to policy to assure the cost-effectiveness and value of care. Insurance is, by its nature, a collective, cooperative thing. In the long run, the people who are covered under the same insurance risk pool are sharing a finite resource. If they understood that, they would rationally desire for there to be protections against the pooled resource being squandered by other people for low value purposes. In health insurance, such protections primarily take the form of benefit policies. Benefit policies may define which services are not covered because they are considered experimental or cosmetic. They may define limitations based on age, gender, or medical history. They may also set quantity limits on coverage, such as defining the number of physical therapy visits or inpatient psychiatric hospital days covered. They may set lifetime maximum dollar amounts. But, such insurance benefit policies are very blunt instruments. Insurance companies also protect against low-value uses of health care services using “utilization management” programs, including requiring pre-authorization processes, where doctors are required to submit justifications for proposed services and insurance company employees judge whether the proposed services meet “appropriateness” criteria. Such utilization management programs create conflict, and insurance companies generally establish criteria that are very loose to minimize the conflict. As a result, such programs are also very blunt instruments. Clinical protocols, in contrast, can be more precise instruments, taking into consideration the details of a patient’s clinical situation. Clinical protocols are typically developed by physicians, and are ideally supported by evidence from clinical research studies. Clinical protocols can take many different forms, and go by different names including “guidelines,” “algorithms,” “care maps,” and “standards of care.” Whenever we have tried to design clinical protocols, especially for complex and costly care processes such as for low back pain, congestive heart failure, cancer or the care of frail elderly patients, we discovered that different protocols can have very different costs and outcomes. Thoughtful design, rigorous implementation and continual evaluation and improvement of clinical protocols can lead to large improvements of outcomes and large reductions in cost. But, cost effective protocols do deny some people some treatments that would have helped them a little (just not enough to be “worth” the cost). 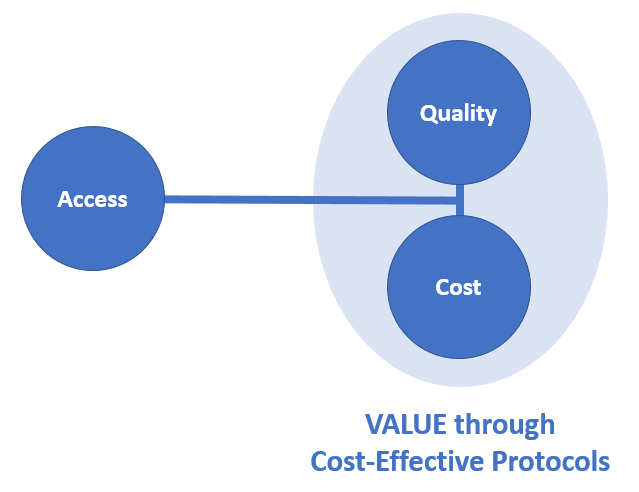 The whole premise of designing cost-effective protocols depends on the recognition and acceptance of the collective nature of insurance and the finite nature of the resources being shared. Furthermore, it is essential that the people for whom such protocols are applied trust the people and the process of creating and implementing the protocols. In for-profit, commercial insurance companies, there is a fundamental conflict of interest if the owners of the insurance company get to control the design and implementation of the protocols and if they get to keep the money saved from denying services that could have helped people — even a little. In a single payer system, the entire country (or each state) is treated as a risk pool, and the government plays the role of protocol developer. Some people are OK with that, while others are loathe to assign such authority to governments. If we continue to have private insurance companies or accountable care organizations bearing the risk for populations of patients (as in the current Obamacare system), then such organizations can make decisions about clinical protocols. In either case, we absolutely need to create structures and mechanisms to ensure that the people receiving the care trust the people and process used to create and implement cost-effective protocols. Some private organizations, such as Group Health Cooperative of Puget Sound (now part of Kaiser Permanente), created some structures and processes designed to build this trust back in the 1990s. Although most other advanced countries already accept cost-effectiveness and pursue the development and implementation of cost-effective protocols, and although there would be a huge opportunity to reduce cost and improve outcomes by doing so in the U.S., making this policy shift in the U.S. will be very difficult. The U.S. population has been taught to be wary of “rationing” and “death panels” and U.S. doctors have been taught to reject “cookbook medicine.” Nevertheless, moving the health policy discussion in that direction may, in the long term, do some good. Politicians asking “what’s next” after the apparent end of the quest to repeal Obamacare should consider turning attention to bringing cost-effectiveness to health care through clinical protocols. In the June 15, 2017 issue of the New England Journal of Medicine, Andrew Ryan and colleagues from the University of Michigan published an evaluation of the Medicare Hospital Value-Based Purchasing Program (HVBP). To summarize, if you offer a 1% incentive, and then dilute it by offering it only for the 40% of hospital patients covered by Medicare, and then dilute it further by spreading it across three domains (clinical process quality, patient experience and mortality), and then dilute each of these by basing them on multiple component metrics, and then dilute it more by choosing metrics that have already been reported for a number of years (and therefore the “low hanging fruit” improvement opportunities may already have been picked), and then further dilute it by offering the incentive mixed in with many other incentives for such things as meaningful use of EMRs…..
You don’t see impact, even after 4 years. The thinking behind HVBP is like homeopathy, where the practitioners assert that the more they dilute the homeopathic remedy ingredient, the more powerful the remedy becomes. Imagine if a company hired a CEO and wanted to incentivize her to achieve growth and profitability. Would they consider a 1% incentive to be meaningful (even without further dilution). No, the board would choose a number 50 to 75 times higher. How about an equipment manufacturer choosing an incentive percentage for its sales team? One percent sound like enough? This morning, I read about the recently announced next generation version of the CMS Comprehensive Primary Care model, which will require multi-payer participation and will involve up to 5K practices in 20 regions. I agree with the idea of pursuing payment and delivery system changes on a multi-payer basis to make it more compelling to providers. I also agree with the idea of prepaying some E&M and then paying reduced FFS for E&M to cover only marginal cost of E&M office visits to make providers incentive-neutral on encounter modes. I also disagree with the Track 2 idea of partnering with “CMS-convened” IT vendors and contractual commitment to specific IT capabilities. That approach basically takes MU, which was a huge distraction from real improvement, to even more obnoxious levels of micro-management. Overall, I share the Fed’s frustration with the limited impact of previous efforts to transform primary care payment and delivery models, but I think the solution should be to define incentives which are more timely, coherent and consequential, enabled by more meaningful transparency requirements, clearer care relationships and some empowerment of primary care delivery organizations to define their own referral networks. At a recent meeting of the American College of Physicians covered in MedPage Today, Neil Kirschner, PhD reported on the growth of ACOs. Dr. Kirschner is the ACP’s senior associate of regulatory and insurer affairs. He reported that in March, 2012, there were only 136 ACOs that had ACO-style gain-sharing contracts with Medicare, a commercial payer or both. Those ACOs included 91 “hospital-based ACOs” and 45 that were described as “physician-led ACOs.” In the last year, the number of ACOs has almost tripled from 136 to 391. 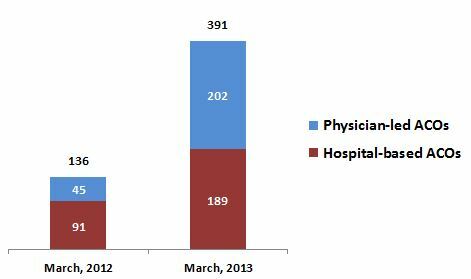 And, significantly, the 202 physician-led ACOs now outnumbers the 189 hospital-based ACOs. Why are physician-led ACOs growing faster? So, why would hospital-based organizations ever enter into an ACO-style gain-sharing agreement? Two main reasons. First, as a defensive measure. By forming an ACO in which they are involved, they can avoid or delay the formation of a physician-led ACO. It is better to be “doing” than to have it done to you. Second, as a way to prepare for a potential future state where providers are bearing far more risk, such as in capitated reimbursement arrangements. 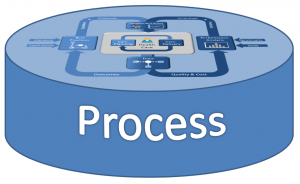 It takes a very long time to develop effective population management capabilities, including establishing effective governance, building trust, deploying the right health information technologies and analytic systems, and, most importantly, recruiting and developing human resources that can effectively use data and improve care processes. Finally, a note about the use of the term “ACO” and ACO growth statistics. Many people get confused about the definition of ACO. Some argue that an ACO is, by definition a specific type of Medicare reimbursement arrangement, the Medicare Shared Savings Program (MSSP), created by the Affordable Care Act (ACA). But, I don’t agree that the term “ACO” defines a type of contract, and that the term ACO only refers to Medicare. The “O” is for organization. On its face, the term refers to a type of organization, not to a type of contract. When people generate statistics about ACOs, they should be counting organizations, not gain-sharing contracts. In common use, people are most likely to refer to a provider organization as an ACO if at least one such contractual arrangement includes a fee for service component with some risk sharing that includes at least some up-side opportunity to share in savings. The Medicare MSSP and Pioneer ACO contractual arrangements are just prominent examples of such contracts, not limiting to the definition of ACO. Because of that fee-for-service connotation, people don’t tend to describe a staff-model HMO as an ACO, even though they meet the definition I proposed above. Furthermore, when categorizing ACOs, it is important that the categories are mutually exclusive. The term “physician-led” seems to refer to an attribute of the governance of the ACO, such as whether the person serving as the CEO is a physician or whether the majority of the shares or votes on the board of directors are controlled by physicians or by people that are employed by physician organizations. The term “hospital-based” seems to refer to whether the provider organizations that own the ACO include at least one hospital or hospital-based health system. An ACO can include a hospital as a co-owner and still be “physician-led.” Therefore, there is inherent ambiguity in the statistics comparing the number of physician-led to hospital-based ACOs. We focus on optimizing care processes, analyzing data, implementing technology, and the other technical and scientific aspects of our work to improve health care. But, this video created by the Cleveland Clinic is a touching reminder of the human element, advocating for empathy in our work. I won a $1 bet. As I described in a previous post, I bet my brother-in-law, an attorney from Chicago, that the law will be upheld. I will be driving to Chicago this weekend to attend my father’s 75th birthday. I’ll see my brother in law there. He’s a trustworthy guy, so I’m confident he’ll pay up. I was right about the majority argument. Like my brother-in-law and most of the pundits, I was originally focused on the question of whether the individual mandate provisions of the reform law represented an unconstitutional expansion of the federal government’s power to regulate interstate commerce. My first blog post on the subject explored that issue. But, then I read an interesting piece in the Atlantic by Jack Balkin, a constitutional law professor from Yale. As I explained in my second blog post on the subject, Balkin argued that the penalties associated with the controversial individual mandate should be considered a tax, and are therefore a constitutional exercise of the federal government’s taxing powers. I found the argument convincing. But I never heard anything more about that line of reasoning until this morning, when we learned that this argument is exactly the one that Chief Justice Roberts made in his majority opinion. The law was upheld with a minimum of expansion of federal power. I shared my brother-in-law’s concern that if the law was upheld based on an expansive view of the interstate commerce clause, it would have the effect of dramatically expanding the power of Congress to dictate how we all live our lives, without being constrained by the political unpopularity of raising taxes to pay for it. But Chief Justice Roberts called a spade a spade. Despite the terminology of the law itself, and despite the repeated assertion by President Obama that the law does not raise taxes, Roberts declared at least the individual mandate penalty to be a tax. I do still think that the reform bill has the effect of expanding expectations about the role of the federal government in our lives, and so I still have some concern about that. But, of all the arguments that could be made to uphold the reform law, I think the one Roberts selected is the least bad in terms of expanding government powers. We can continue the journey toward a more civilized and compassionate health care system. 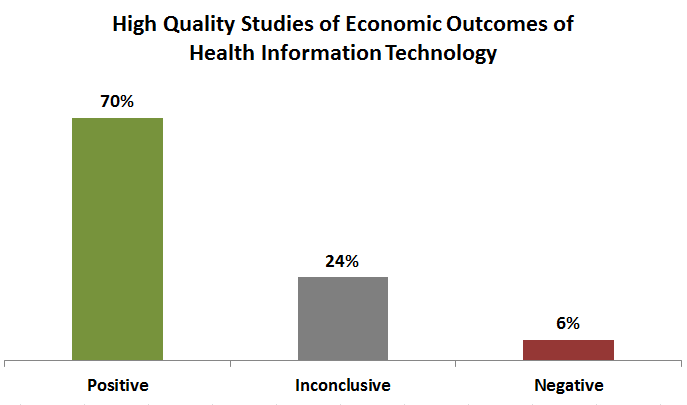 Almost nobody is asserting that the health care reform law is perfect. But, in my opinion, it is a step in the right direction. It is better than creating a government-run monopoly. It is better than waiting forever for each of 50 states to exercise their authority to compel people to buy health insurance. It helps millions of Americans have a sense of security. And, it underscores that our strong tradition of individualism is balanced against our sense of duty to one another as Americans and humans. I am energized to continue health care improvement. Over the last few years, our field has built up some momentum in transforming health care. Health care leaders were feeling a sense of urgency to increase their capabilities in population management, analytics, lean process improvement, clinical integration and health information technology. I feared that if the health care reform law was struck down, it could lead those leaders to relax for a few years to wait and see what comes next. I am excited by the prospect that our field can continue to build momentum that spills beyond the limited confines of the reform law itself to allow us to make more fundamental progress in the care delivery system itself. Oh, and did I mention I won a $1 bet?